The AMG Allied Military Government stamps were issued from 1946 until 1948 and were provided through the occupation services of the American and British military. An American-British zone stamp was issued from 1948 until 1949, within the “Bizone” that was created when the two zones merged at the end of 1947. 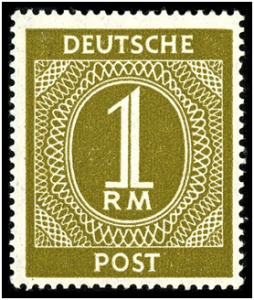 Russian zone stamps were issued during 1948 until 1949, which is when the Soviet zone was turned into the German Democratic Republic. This happened at the same time that the Trizone was turned into the Federal Republic of Germany. It should be noted that in early 1945, many towns attempted to create their own stamps for postage, creating charity stamps, as well as souvenir sheets, even though these activities were unauthorized under any government authority. Collectors wanting to learn more about stamps issued during the Allied Occupation of Germany can contact Treasure Coast Stamps. We are happy to help you with learning more about the fascinating Allied Occupation of Germany stamps.